Stores reference 22c/930. The frames are in very good condition with little rubbing or paint loss but some verdigris. The pierced ventilation holes would suggest they may be of post WW2 manufacture. 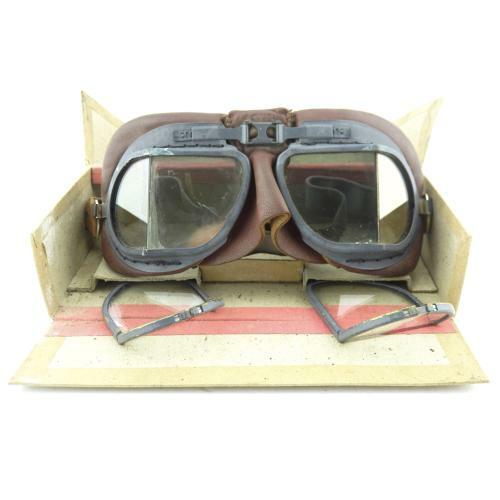 The leather goggle surround is excellent with King's crown Air Ministry marks at the brow and the suede backing is reasonably clean with an A.I.D mark at the brow. The strap is a little faded and lightly soiled but retains much of the original elasticity. The metal strap components have only surface corrosion. Fitted with tinted lenses that display well but do have delamination marks. Complete with the original box of issue in sound condition. This also contains a good pair of clear lenses. Antidim tin absent. Good '+' overall condition. Stock code G20226.